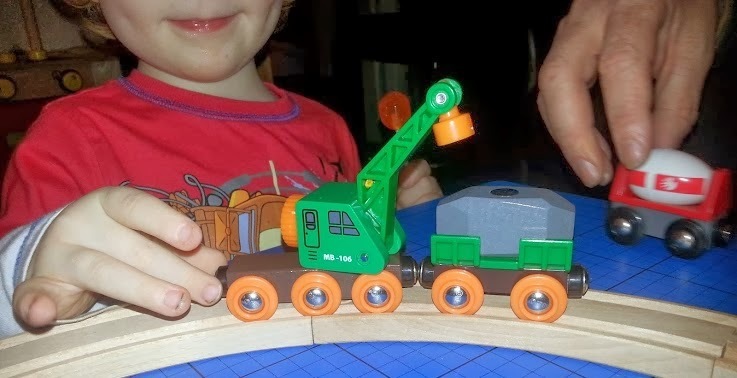 The Brio Clever Crane Wagon is one of the add-on sets for the Brio Train Track and we've been sent it to review by The Toadstool Online Toy Shop, along with the Remote Control Railway Set which we reviewed in this post. Included are a crane wagon and truck with a shaped top for the chassis which holds the load, and a very heavy and convincing boulder. This is a lovely little wagon and goods carriage. The cab of the wagon turns 360° so it's really easy to line up with the rocks (or the canisters and other items from other sets) and pick them up magnetically. 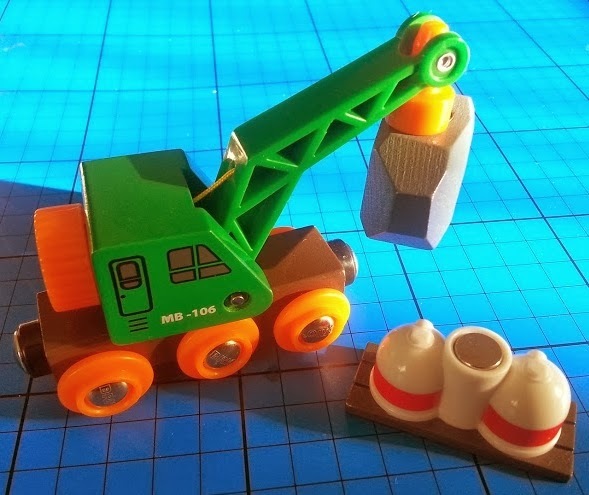 The arm of the crane raises and lowers with a simple turning mechanism at the back of the cab. The colours are lovely - brown, orange and green and the plastic colours match the wooden painted ones very well indeed.It's a very attractive little vehicle. 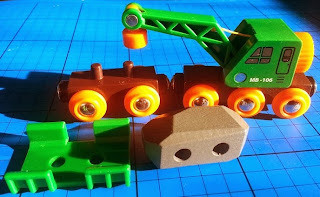 The magnets are good and strong and have no problems lifting the loads or pulling the carriage. The wagon does occasionally tip over with a heavy load held out to the side, but it's not really an issue and doesn't affect play as you're usually right there holding the wagon when it overbalances. Surprisingly although the 'engine' and cab are wooden, all other parts are plastic or metal including the body of the carriage. I don't think this spoils the toy, it makes the movements smoother, but I do think it maybe indicates a swing towards more use of plastic. This is a fantastic toy for encouraging imagination and story-telling and learning about the world and how pulleys work. When either of the boys play with it they're making noises and chattering to themselves and develop a whole storyline. This has a suggested age range of 3+ and I agree. Both my boys can 'work' the crane and understand the magnetic aspect perfectly. We love this crane. It's really not an expensive toy at all and should last forever, and when used as an addition to a larger set it really does add an awful lot for your money. This month sees the start of ToadTest Parties (toy talk & reviews) and they're kicking off in style with Brio wooden train play. Join in the conversation on Twitter (7th Nov), Facebook (12th Nov) and Google+ (18th Nov) from 8pm-9.30pm to learn more about Brio, read reviews of the Brio range, have your questions answered and even win prizes. 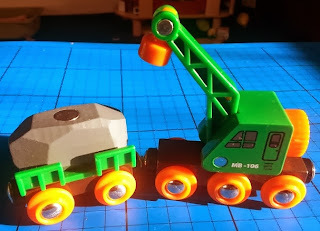 I was sent the Brio Clever Crane Wagon to review. That is a lovely addition to any train set! Love this kind of thing. Even though they are just a small toy, when my boys get something like this it tends to be their favourite presents and they love it! They get hours of play from just one small train and carry them round all the time and this one looks very cool! Must go have a look at the remote control set too as that sounds amazing. Think my kids have brainwashed me that i actually get quite excited about toy trains lol! Someone else I know is going to be after this I think!